All over the world teachers are at the sharp end of education. Whatever the level of development of any given country, expectations of them are always high, usually too high. They tend to be routinely blamed for the ills of society and are rarely given credit. Is there now a situation of crisis in teacher education worldwide? This book highlights the predicament of teachers in widely differing locations and situations. Witold Tulasiewicz. Is There a Crisis in Teacher Education? Over the past 250 years or so, expectations of educational systems in terms of guaranteeing national well-being have been high. Such has been the marriage between the modern nation-state and its system of formal, usually compulsory, schooling. Whatever the level of development in any given country, many of the ills of society are routinely blamed on schools while successes are claimed by politicians. At the sharp end of this unfair process are teachers, in some countries always having been under direct political control and pressure to deliver, and in others with traditionally more liberal systems of regulation they are being reined-in. They are under pressure and it shows, from floods of early retirements in the developed world to rampant absenteeism in some developing countries as a necessary protest at rarely being paid. There is certainly a crisis, but where is the root cause? Teachers have one last line of defence – their training. George Bernard Shaw’s famous dictum undergoes a slight modification: those who can, teach, and those who can’t become teacher trainers. Is this fair? Is training necessary anyway? Should there be any place for theory in programmes of teacher education and training? In short, as one of our contributors has it: is there a crisis in teacher education? If so, is it a global demise? 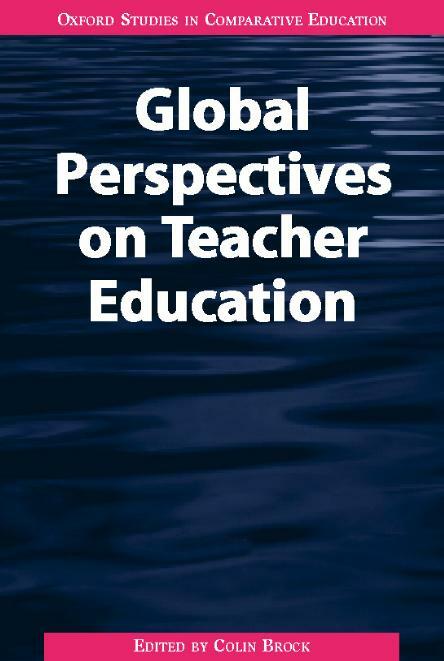 This volume cannot claim to be comprehensive in a global sense, but it does highlight the predicament of teachers in widely differing locations and situations. These range from an historical example within England and Wales of a wasted opportunity to enhance the quality of teacher education and training in the early 1970s; through an evaluation of our current situation in relation to European partners; to issues of gender, theory, poverty, rationalisation and modernisation in different examples from ‘the South’. The whole is introduced by a global analysis in which Roger Iredale illustrates what can and what cannot reasonably be expected from one, generally underfunded, component of public sector provision – a mere cog in the convoluted development machine. Whether there is a crisis or not, these contributions clearly show an immense range of recognition of the notion of teacher education from the dismissive to the complacent. Certainly the sub-profession of teacher educators needs to conduct a rigorous self-evaluation. Are not some of the criticisms justified? Should there be a distinction between initial and in-service training? Is not the school rather than the university the prime location for meaningful training? In many countries consideration of such questions is being forced through into policy by underfunding rather than by professional considerations. Are we making virtues out of necessities? Hopefully this small collection of papers serves to answer just a few of the many questions it raises. Colin Brock is tutor in comparative and international education at the University of Oxford Department of Educational Studies, and has worked on programmes of teacher education and training in various locations in Africa, Asia, Latin America and the tropical island zones. Lynn Davies is Professor of Education and Director of the Centre for International Education at the University of Birmingham. She has worked widely on issues of gender, education and development in Africa and Asia. Roger Iredale has recently retired from the position of Professor of International Education and Director of the Faculty of Education at the University of Manchester. He was formerly Chief Education Advisor at the Overseas Development Administration. Barbara Jaworski is a university lecturer in Education at the University of Oxford Department of Educational Studies, where she specialises in mathematical education, as well as leading the contribution of the Department to the MEd Programme of the Institute of Educational Development at The Aga Khan University in Karachi. Humala Khalid has recently completed her doctorate in international education at the University of London Institute of Education. An experienced educator in Pakistan she has been active in the researching and development of educational provision in rural Pakistan and the issue of gender within it. James Porter, formerly Principal of Bulmershe College of Higher Education and Director of the Commonwealth Institute, London, is now an international educational consultant. He was a member of the ‘James Committee’, about whose work he writes in this volume. Elwyn Thomas, formerly Head of the Department of Education in Developing Countries at the University of London Institute of Education, is the foremost authority on education in South-East Asia in the UK. He was seconded for several years to the National Institute of Education in Singapore. Witold Tulasiewicz is a Fellow of Wolfson College, Cambridge and a former lecturer in education at the University of Cambridge Department of Education. He now holds visiting Professorships at the University of Calgary, Canada, and the University of Mainz, Germany.